So while it’s not actually a newbie, the recent relocation of this all-vegetarian cantina to bigger Gertrude Street digs has resulted in queues as crazy long as the crazy eyes of their lizard mascot. Here, amidst the 70s orange tiles and bamboo benches your corn tortilla tacos come out packing a jammin’ combo of chilli-spiced and grilled tofu or black beans with thick slices of avocado, mozzarella cheese, and a fresh tomato salsa. They need a little salt, but squeeze on some extra lime and as much El Yucateco habanero hot sauce as your face can handle (not much), and hot damn! You have yourself a pretty convincing reason to climb on the meat-free wagon. 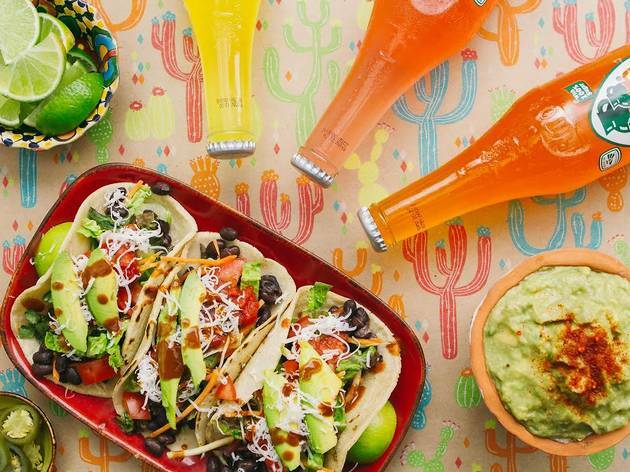 Owner Simon Fischer makes sure that every last burrito and taquito (crisp corn tortilla cigars coated in cheese, guacamole and salsa) is vegetarian, vegan or gluten free, so not surprisingly, this joint is bandanna-deep with appreciative eco-warriors. Even if you are a fiend for the beast, sunny outdoor benches, chilli powder fries and live music on weekends make this joint worth a look-in – if only to try the fiercest Margarita we’ve ever fallen into. Served straight up in a short salt-rimmed tumbler, it’s just a regular mix-up of chilled fresh lime juice, Cointreau and tequila, but if you can down three and walk away, you’re our new hero. 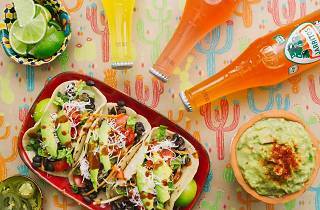 Trippy Tacos is an institution and a feel-good, good time.